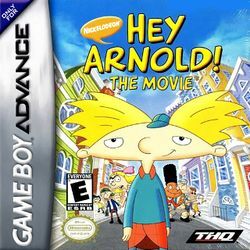 Hey Arnold: The Movie is a platform game that was developed by Altron and released by THQ upon the Game Boy Advance (on May 29, 2002); it is based on the Nickelodeon cartoon series of the same name which was produced by Snee-Oosh Inc., but the original pilot episode was produced by Games Animations, who'd previously produced the third, fourth and fifth seasons of The Ren & Stimpy Show. Arnold must also collect American footballs in the game, referring to his nickname of "Football-Head". This page was last edited on 23 November 2015, at 16:16.